Wide beds maximize limited garden space. The unusually warm and dry weather in March created perfect conditions for early digging in the garden, dry, thawed soil. Usually, early spring means wet or frozen soil and digging in wet soil will destroy the structure. My husband, Mark, was anxious to dig out the stump of the spruce we had removed because it outgrew our yard. We never limbed it so the spruce’s skirts nicely shaded out the grass underneath. So after removing the stump and shallow roots, we have the perfect space for a new garden. It’s also good timing since I have a lot of seedlings started, as you know from reading last month’s column. How do you select a site for your new garden? Consider these factors: light, water, size and, especially if you are planting vegetables, distance to the kitchen. A vegetable garden needs five or six hours of sun daily, preferably morning sun–not the scorching rays of summer afternoons. If you are growing flowers, you can choose varieties suited for just about any proportions of sun and shade. Because our growing season is so short, you may not want to choose a site where the snow lingers, as it will take longer for the soil to warm. The size of my new garden was dictated by the footprint of the spruce. 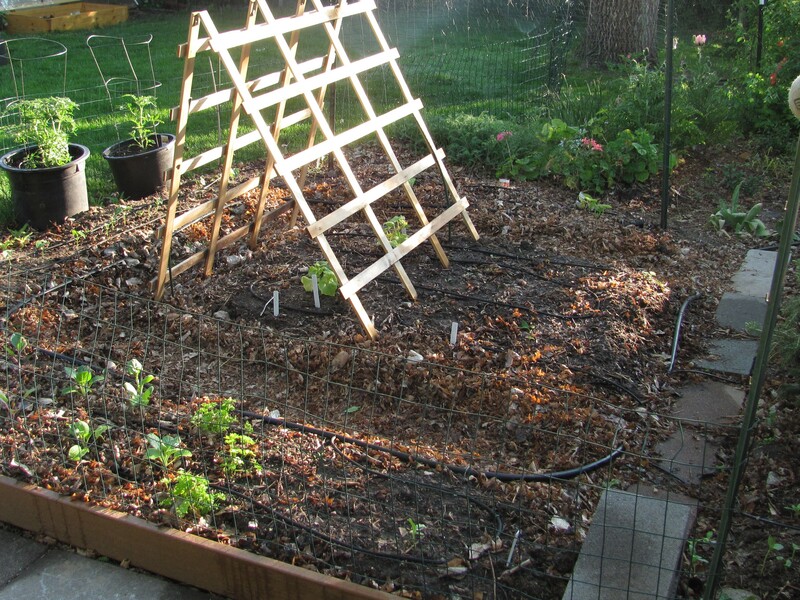 It’s 11 by 14 feet, manageable for a first effort at growing vegetables and annual flowers. If the vegetable garden (or any garden) isn’t close to the kitchen, it won’t get the daily inspection that leads to success, said Catherine Wissner, University of Wyoming Cooperative Extension horticulturist. I may “neglect” standard garden practices such as rototilling and spraying weed killer, but I don’t neglect to enjoy visiting my perennial garden often, pinching the occasional bad bug or pulling a tender young weed. Distance to water is important—how far are you willing to drag the hose? 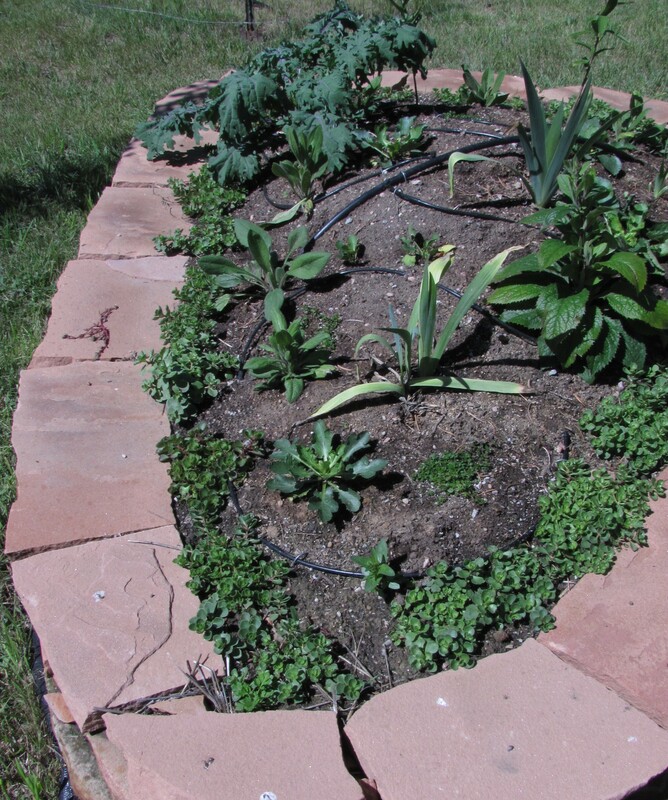 Can you set up a drip irrigation system? You could kill grass using chemicals such as Roundup if you are extremely good at following directions. Another option is to stake clear plastic over the turf for a few weeks, allowing the intense heat of the sun to kill off the grass and weeds. Digging up turf with a sharp spade takes less time, though it’s hard work. One advantage is it will keep you from making your garden too large in the first year. If you are careful, you can use the spade-sized chunks to fill in bare spots elsewhere, or knock the dirt off and compost the remains. Every gardener believes that his or her soil could stand improvement. I believe enough compost added over time can redeem almost every soil type. Cheyenne’s default soil is clay-like, making it difficult for plant roots to grow and draw water. Local gardeners overcome this by digging in compost–partially decayed plant material–to a depth of about two feet. Mark did just that for our new garden, using the leaves from our trees that served as protective mulch for my perennials over the winter. Adding more to the top few inches every year eventually makes for loose and fluffy soil. A word of advice: Check for underground utilities before digging in your yard. All it takes is a simple call to 811 (www.call811.com). Compost is available commercially in bales. 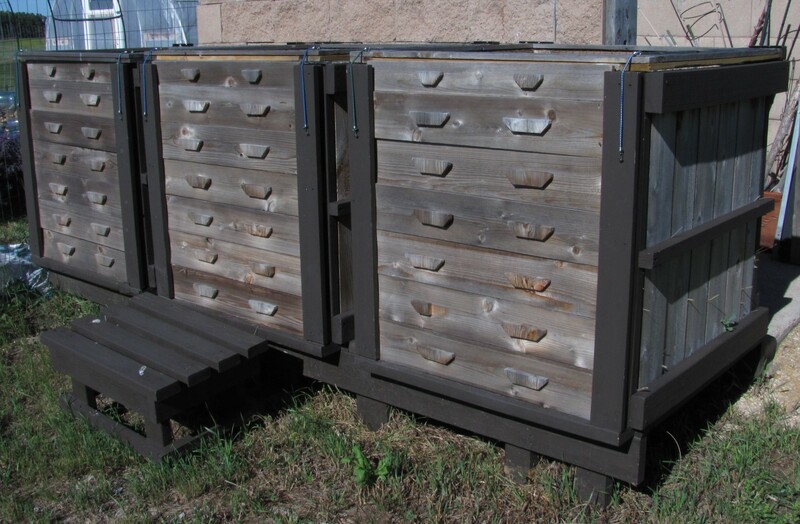 It’s also available from the City of Cheyenne’s compost facility at 3714 Windmill Road; hours are Monday through Saturday, 10 a.m. – 6 p.m. and Sundays, noon to 4 p.m.). A word of caution: Be sure the compost doesn’t contain residual herbicides. 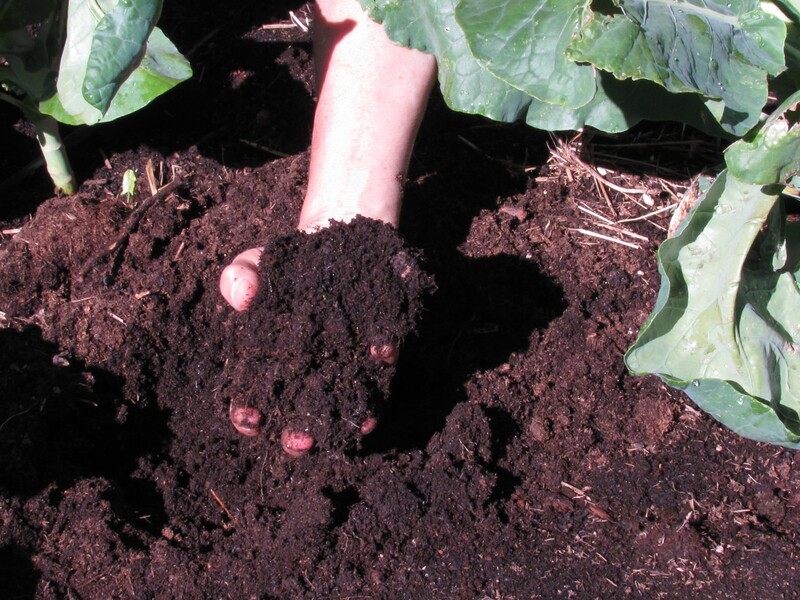 Using livestock manure in a vegetable garden is tricky. Unless it is composted at high, even heat, it could transmit pathogens, such as salmonella, to people consuming the crops. And it is possible to apply too much and burn plants. My experience is that composted leaves and grass will improve soil structure—and encourage the soil microorganism community to flourish, acting as a low dose of fertilizer. If your plants have failed to thrive in the past or you are curious about the fertility of your soil, you may have it analyzed by experts who can tell you what kinds of amendments might be needed, and how much. Colorado State University has a soil testing lab. Call them at 970-491-5061 or visit www.soiltestinglab.colostate.edu. The routine test is around $30. Remember, our soil here, with few exceptions, is alkaline, not acidic as it is back East, so don’t add wood ash and limestone. If you do a good job of digging a new garden, you shouldn’t have to do it again. Obviously, perennial gardens don’t get rototilled every year. Mine receives a top dressing of leaf litter annually because I don’t sweep the soil surface clean (another instance of my gardening by “neglect”). Many perennials are native to less than perfect dirt anyway. But what about my plan to grow annual flowers and vegetables from seed this year–and perhaps years to come? Will I have to convince Mark to dig as deeply again next spring, or get a rototiller? I won’t, if I take the advice of Eliot Coleman, an organic market gardener in Maine and author of the book “Four-Season Harvest.” After the initial dig he amends only the top few inches each year. That way soil structure isn’t destroyed. Also, the less you disturb the soil, the fewer weed seeds sprout. Shane Smith, director of the Cheyenne Botanic Gardens, is also a soil protectionist. He is a proponent of wide beds rather than planting vegetables in traditional rows. Plants are set in short cross rows or staggered, depending on the space they need. Somewhat like establishing raised beds, minus the boards to contain the soil, each bed is as wide as you can comfortably reach, maybe 3 feet. A 2-foot-wide footpath between beds means you never walk on the beds themselves, preserving the fluffiness of their soil (roots need the air), and you never have to waste time and money improving the soil of the pathways. For more information, pick up a pamphlet at the Gardens or visit online at www.botanic.org. Next month, I’ll look into best practices for transplanting, direct sowing, and picking out plants at the nursery. If you need to transplant your starts into bigger pots, remember to hold them by their leaves only, to avoid crushing their stems—they can always grow a new leaf, but not a new stem. Categories: Garden site prep | Tags: compost, garden site, rototill, soil amendment, soil test, wide bed | Permalink.